Before you embark on any new business it's always a good idea to research what is already out there. I've heard many a new business startup say they have no competition, that there idea is unique. Which may be true in some cases but it's pretty rare. There's always someone doing something that is at least similar. Competition is good as it means there is demand for your idea. If you can find a way to do what the competition is doing, only better, or fill a niche in the market that isn't currently being catered to then it's going to make competing a whole lot easier, so... research! 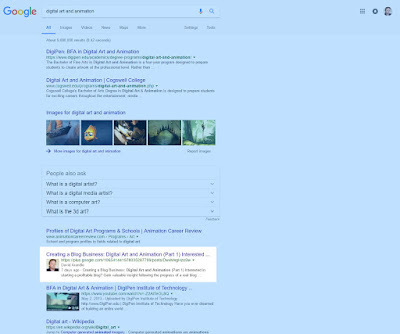 In part 1 I included a link to a Google Search for digital art and animation that turned up a list of mostly educational institutions promoting their related courses. Interestingly, when I clicked that link today, Part 1 of this blog series is the fourth entry on the first page of search results (keep that in mind - all the search keywords are in the heading of this series). On this search alone I browsed through five pages of mostly colleges and other educational organisations promoting their courses. I didn't come across anything remotely like the site I want to build. The number of digital art and animation courses is promising as I may be able to approach these organisations and offer advertising space as a possible income source. fourth in my search results but I also find a couple of contenders on the first page. The digital arts blog of the Fashion Institute of Design and Merchandising which has four different campuses located around the USA. Although 'Fashion' features prominently in the name the school and blog appear to be very focused on a wide variety of creative and digital arts. Their blog, covers a fairly broad range of digital media creative arts but for the most part features areas of interest that relate back to the courses available at FIDM. The blog layout and design is well organized and could be a good model for my own site. Whilst it's a very good blog, I'd say its lack of independence is holding it back from being a general resource for anyone not familiar with or having been a student of FIDM. Described as the UK's leading resource for creative professionals, if you haven't heard of them and you're a digital artist it was probably only a matter of time before you would. This site pretty much covers everything relating to digital arts and is definitely a direct competitor. Digital Arts Online feels big and is owned by one of the world's leading media and technology companies. It features a wide selection of articles, guides and is contributed to by many different sources. Definitely a great resource. Honestly, this site is something that I would aspire to be eventually but perhaps its 'bigness' can work to my advantage in the short term? 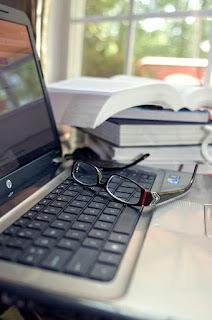 Maybe my site can have a more personal connection with readers simply by being smaller and more personal. Just a thought. This blog is partnered with Pluralsight the online, on demand learning site for technology professionals including all aspects of digital creative arts. It's very much like FIDM but its courses are not limited by geography at all and the blog covers all aspects of digital arts. If I'm honest their blog is probably pretty close to where I'd like mine to be once it's up to speed. I did notice that their 'Latest News' front page featured all articles from over a year ago. Blog neglect isn't a good sign. The classic example of why having a quirky domain name can be a bad idea. 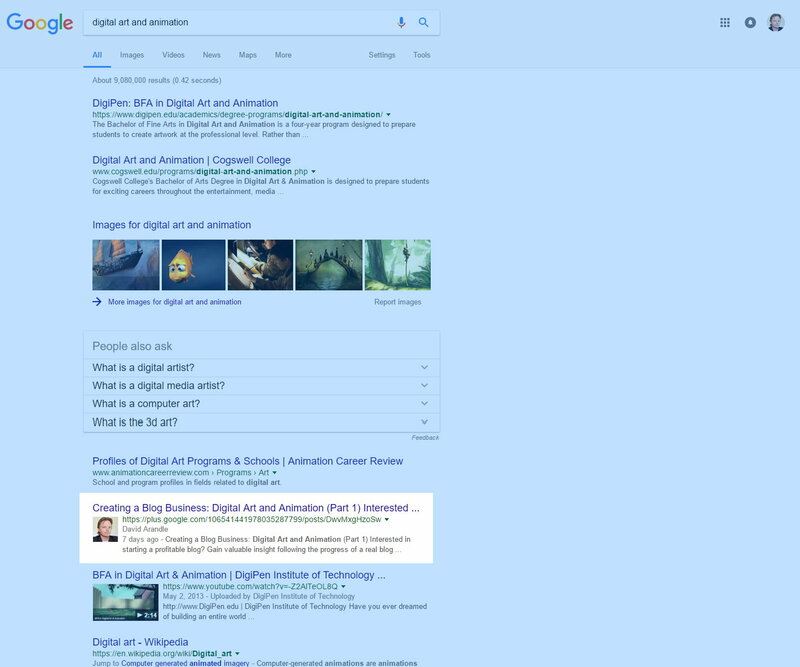 Nobody is doing Google searches for 'Creative Bloq' and I only found the site through the search term digital art animation tutorials news reviews where the site was listed eighth as 'Computer Arts Magazine | Creative Bloq'. That said, the site itself is really good covering all aspects of visual creativity that can be narrowed down to just the digital arts section if you wish. The site is owned by Future Publishing Limited, a leading international publisher of digital media. I could probably keep going and unearth many more sites through different combinations of keywords relating to digital art and animation. Of the searches I did, the majority seemed linked to educational institutions or were blogs relating to specific artists and their work/interests in the field. I deliberately haven't looked at social community sites like Deviant Art or New Grounds as these, I feel, serve a different purpose overall despite there being some obvious crossovers. What you do with this research is up to you. Just being aware of competitors and what they're doing is a good start. For the most part, I'd suggest studying competitor sites, borrowing what you think works, steer clear of what doesn't and look for some niche they may not be filling that you can take advantage of. That's what I'll be doing. As the research stage of this series turned out to be much more detailed than I anticipated, I'll leave it to next week to look at my Site Structure and Content, along with Ways to Make Money.